I really, really enjoyed this book! Which is not something I often say after reading a biography. Most biographies feel like work even if you’ve chosen to read the book for pleasure. They all seem to invariably contain sections that can only be described as just “a slog”. Not so with Ashlee Vance’s biography of Elon Musk. Musk is obviously an interesting person with an interesting life. But so was Steve Jobs and others on the biography shelf – you don’t write a biography about an average person after all. What elevates Elon Musk above the rest, though, is Vance’s writing. Vance is a supremely talented writer, spinning together complex sentences that are both highly readable and devastatingly exact. Even if you don’t actually read this book, just pick it up and read a few pages to see this mastery in action. I am an official Ashlee Vance fan. Another thing I enjoyed about this biography, besides the writing, was that Vance wasn’t afraid to deviate from the timeline. Most biographies run in a straight line from birth to death (or wherever the subject was in their life at the time of writing). Vance did go chronologically up to a point. 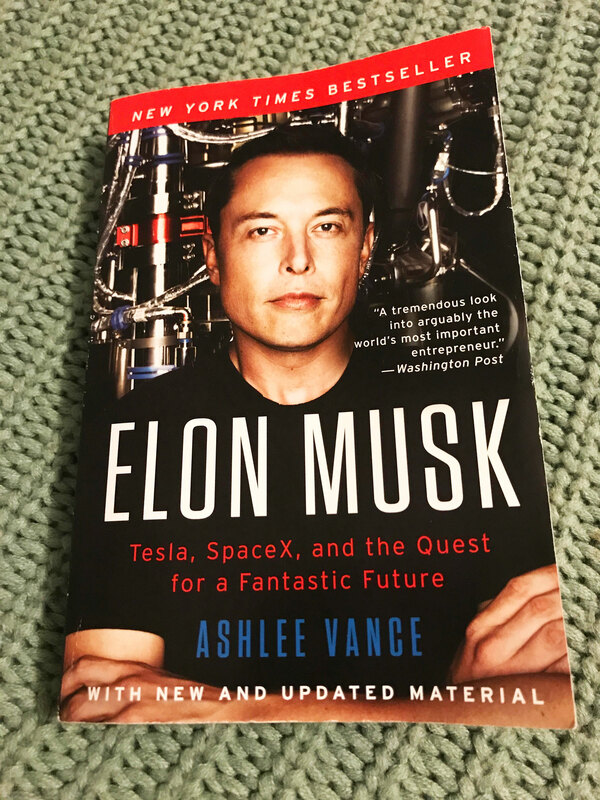 But after he detailed Musk’s “darkest hour” in business in 2008, where he nearly lost Tesla and SpaceX, Vance devoted a hefty chapter each to Tesla, SpaceX, and Solar City/the unifying principles that connect Musk’s businesses. This was a really good way to lay out the remainder of the book and actually made it really easy to then follow the development of those three businesses into what we see today. On the subject of what this book was actually about, I emerged with a new respect for Musk. I’ve admired his work but didn’t know that much about the person behind the companies. Even when I did a little research into the Tesla Car earlier this year for one of my Writing Project Wednesdays (they’ll be back, I promise! ), I only scratched the surface of who Musk was. What I admire the most about Musk is that he didn’t just build phenomenal, world-changing businesses….he managed to build phenomenal, world-changing businesses that fit into and serve his overall vision for his life’s while also being interconnected with each other. Absolutely amazing. This biography was published in 2015. Since then, Musk’s star power hasn’t dulled any. If anything, he enjoyed a little boost from another high-profile relationship with an actress, Amber Heard. I’m looking forward to seeing what Musk does next…and hopefully, I’ll one day have a Model S of my own! Great blog, and a great book. I listened to the audibook version, and Elon is pretty much my hero. And although I try to get through biographies, I agree with you in that most are “a slog.” Good work, and keep it up. Thanks for reading my blog Alex! What other biographies have you read (and enjoyed)?